This past weekend I took a look at Rifter on steam, a game that at the time you’re reading this is probably out. Rifter is another physics platformer, I know I reviewed quite a few, but let me tell you I had a blast with it. This is a supplementary review, if you want to see my first impressions of the game right after I was done playing it, go check the video down below. The first thing that you will see when you boot up the game is a screen asking you to select your control scheme. You can select between two keyboard schemes and two for the controller. For this review I used the “WASD” keys and mouse, make sure to pick the one that you’re more comfortable with but don’t worry you can change these settings later. 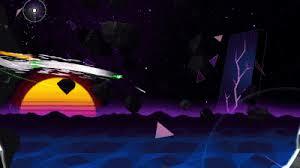 The art style of the game had this neon 80’s vibes to it, down to the sunset in the background that probably some of you will remember seeing in some shirts back in the day. The gameplay, as previous physics platformer we reviewed, revolves around getting from point A to point B while avoiding obstacles and enemies. 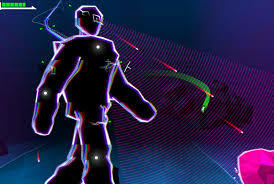 The difference is that this time around you play as a neon green electric guy that swings around using his neon electric hook, like a space spiderman as one of my viewers put it, and you can shoot yourself from hook points to avoid cliffs and to attack your enemies. Actually, that’s the main difference between Rifter and previous games that we played on this channel, you actually fight Bosses. Boss battles in games of this nature boil down to avoiding the boss until you escape, or triggering something so the boss can kill himself. In Rifter you actually fight the buggers! As it is the norm you can also find collectibles in the levels, but you don’t unlock art or extra costumes with them, in Rifter you use these collectibles to obtain and level skills that will aid you in your journey. From a very useful ledge climb to the ability to gain more speed everytime you hook yourself onto a hook point, you will find yourself taking the extra mile to obtain these crystals so you can make your adventure a little easier. The difficulty of the game was well paced as that is very crucial for games of this type. From the tutorial to the later levels, the difficulty ramped up quite nicely. I gotta said the characters I encountered were quite charming. You yourself are the quiet protagonist but you are guided by a small glowing triangle named Tiny. You and Tiny will meet some other colorful characters, no pun intended, on your journey. Like the shopkeepers where you level your skills or a giant named Zip. The larger than life Zip will inform you about secret areas where you can collect more crystals without any ulterior motives other than “He likes to watch”. The music in the game was fantastic! The songs are not locked to the levels, they will cycle through like any playlist and every single one of them is great. Here’s the thrilling part for anyone that makes Youtube videos, you can go to the options menu and click on an option that says something on the lines of “Youtube Friendly” that will disable the songs that will give you any problem when you upload your video. Obviously, this will make your playlist a little smaller while playing but this is a godsend for any Youtuber out there. A very nice touch I have to say, and I can’t praise the developers enough. I found myself getting into the game while streaming it and had a blast! It might not get to the hair-pulling levels of rage when it comes to difficulty (at least for the levels that we played on stream) but I really appreciate the art style of the game and the personality of the characters. Like I have said many times before, if you are into physics platformers of this type Rifter might be for you. Rifter will be out on steam on July 12th. Have you tried the beta? What are your thoughts on the game? Let us know. Now I return to the deepest darkest corners of my dwelling. Good-bye, for now, my friends.